A guest house in the quiet and upmarket suburb of Robin Hills, Johannesburg, is such a gem - where guests are regarded as precious. After years of extensive travel and learning about the hospitality industry, the owners and hosts, Pieter van Zyl and Irma Meyer, custom-built a guest house that caters for all the needs of the discerning business or leisure traveller. At 22 Carats one can expect traditional hospitality, attention to detail, and hosts who provide exceptional personal service. The décor and colour scheme of 22 Carats are themed around gem stones and you will find a ruby, tanzanite, amethyst, amber, aquamarine and turquoise room, all reflecting the richness of the colours of these stones. The passion and enthusiasm with which this project was undertaken are evident in the outcome and the guest house is truly a gem. A sumptuous breakfast, catering for the hearty as well as the health-conscious appetite, is served daily. Lunch and dinner can be provided on request. The rooms all have easy access to the swimming pool and patio area. The guest house has two kitchens. Guests are welcome to use any of the two kitchens on site to prepare tea and coffee, a light meal or chill a bottle of wine. 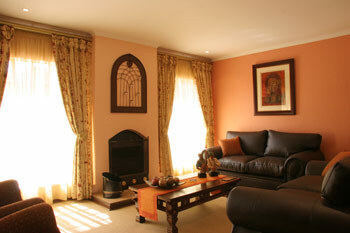 Both kitchens are equipped with a microwave oven, fridge and freezer, oven, stove, crockery and cutlery. A business centre enables guests to send or receive faxes, send or retrieve e-mails, surf the Internet, or simply relax with a selection of daily newspapers. In order to comply with health legislation in South Africa, smoking is not permitted inside the guest house. Guests are welcome to smoke in the garden. Off-street parking secured by electronic gates and electric fencing ensures peace of mind. Children are accommodated by special arrangement. v Chauffeur driven excursions to Sun City, Pilansberg National Park, Sterkfontein Caves, Pretoria, Central Johannesburg, the Elephant Sanctuary, the Lion Park, Hartebeespoortdam, Walter Sisulu National Botanical Garden, Gold Reef City, Soweto, etc. We offer special rates for extended stays. All rates include a full breakfast and VAT, but exclude commissions. The total accommodation cost is payble prior to arrival. In the case of non-arrivals, the deposit is forfeited and the balance of the full accommodation fee is payable.